I like to think of myself as an optimist who always sees the glass as half full or realizes that with every bad thing that occurs in life there is a silver lining, but as we all know having a positive outlook is easier said than done. A few years ago my husband and I returned home to find that someone burglarized our house and stole several of my expensive handbags, along with other items. The optimistic side of me was thankful that it wasn't worse, but I was also devastated and very angry. 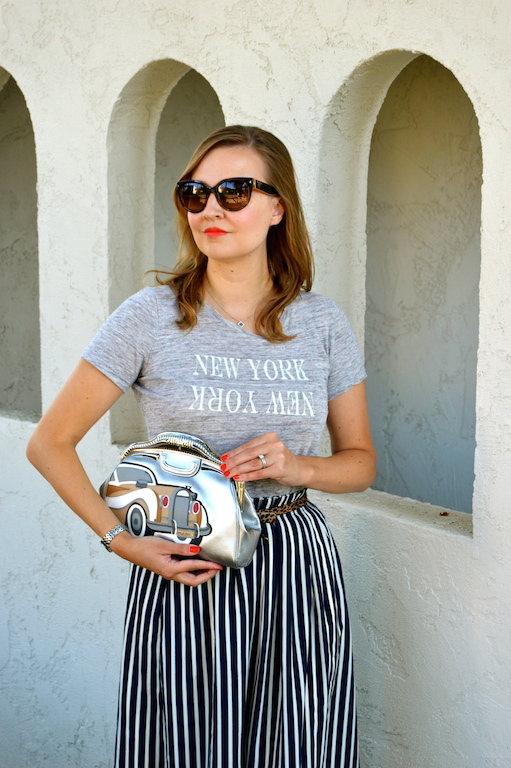 Among my handbags stolen was this silver Prada Car clutch that features a vintage car. I knew this item was somewhat rare and couldn't be replaced easily, which added to my anger. The rarity of the bag, however, actually led to catching the thief who broke into our home. After visiting a dozen pawn shops with no luck, I turned to scouring the Internet for my lost bags. Magically, this clutch, along with a Prada tote that had also been stolen, popped up one evening on a website that sells preowned luxury goods. The bad news was that the car clutch was already sold when I found it on the website. Anyway, to make a long story short, thanks to my detective work and the help of an actual detective from the police department, we caught the criminals who did this and got many of our items back, with the exception of this bag and a few other items. Eventually, via the criminal justice system and a plea bargain, we were financially compensated by the criminals' families for the goods that were not returned. All things considered, this robbery could have ended up far worse. Last month, I finally found a Prada car clutch in new condition for sale online. While it's not my actual bag that was stolen (I can tell by the stitching, which is unique to each bag since they are all handmade), it's as close as one could get. Now I finally feel as if my bag collection is now complete again. To be honest, however, there will always be new bags that I covet! 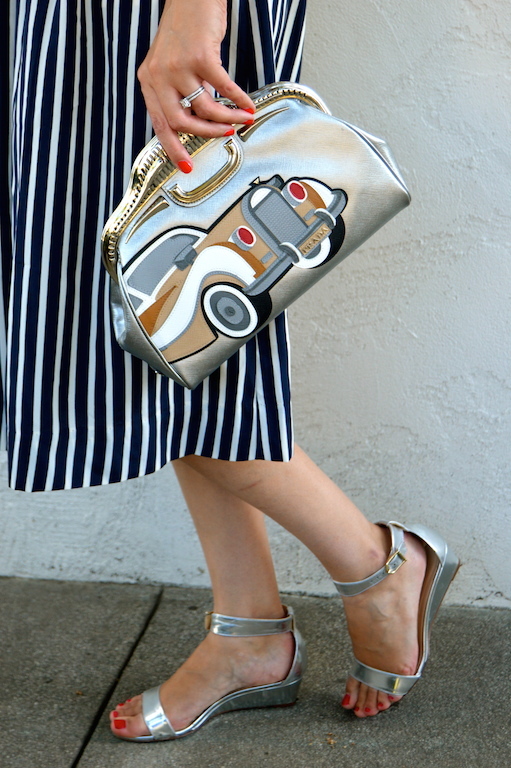 This particular Prada car clutch design came in two different colors, silver and green, but silver is my favorite. As you can see, I've paired it with some other silver accessories. I've always preferred silver to gold, and while gold watches and costume jewelry may have taken the fashion world by storm in the last decade or so, silver, in my opinion, is a little bit more understated compared to the flashiness of gold. Still, that doesn't mean you can't still make a bold statement by wearing some silver accessories like I'm showcasing today. 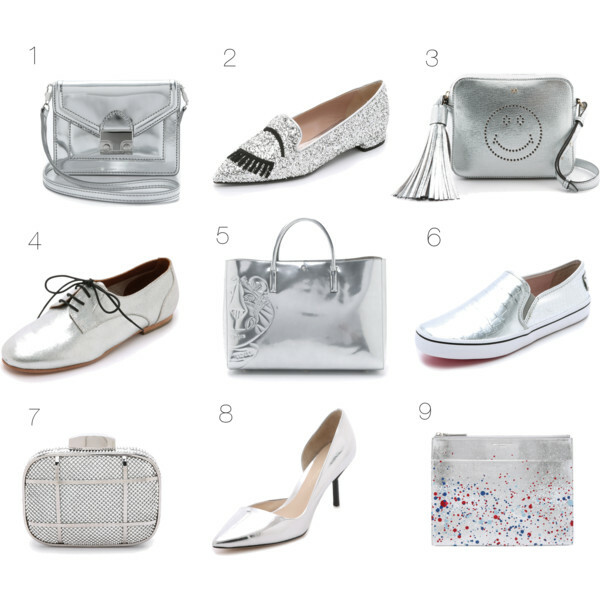 While my silver clutch from Prada is no longer available and difficult to find preowned, below you will find some of my other picks if you want to add a little silver to your wardrobe in the form of fun accessories. Oh no! I am glad you and your hubby were ok though, but how awesome to get some purses back. I love your handbag and skirt here. Very nice retro look. What a crazy story but glad it has a happy ending. You have the best collection of unique shoes & handbags. I am sorry about what happened but I am with you - there is always a silver lining. 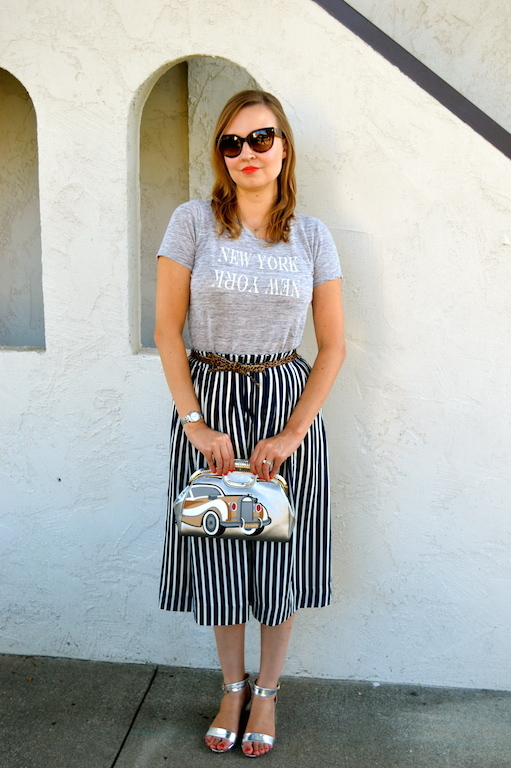 I am glad the silver adorable retro clutch matches your silver/positive attitude too. Love that New York T-Shirt, too. Love this look! Your purse is to die for! Love this!! That clutch is AMAZING!!! The whole look is great!! Really love that top! How scary to have someone come into your home and steal things. Terrifying!! This clutch is all sorts of cuteness. While I don't think I'll ever be able to afford Prada (although I won't say "never! "), I'm thinking I could kind of try to make a similar type with a vintage silver clutch I have. Don't worry: I'll miss it up and won't use an antique car, but I might try something. Love your style! I just found you via the Elegantly Dressed and Sytlish Link Up. You're super cute Katie! Oh my gosh! Lesson learned--read the story before commenting. I was just too eager to compliment the cute clutch. I cannot believe the story behind it! Whoa. I'm so glad you were able to get one (similar) back. I'm also amazed that you were able to find the thief. While this is an awful story, you're right: there is a silver lining to it. So, now not only am I impressed by your style, but also your story telling as well. What a horrible ordeal, but I'm glad you were able to find another clutch! It is so adorable! Horrible experience for you but at least you've found a replacement. Not quite the same I know but well done you for being such a detective. I shall have to christen you Miss Marple! I too before silver to gold, suits my colouring better and I love this metallic look with the grey tee and the hint of leopard with the belt. Such a cute look! 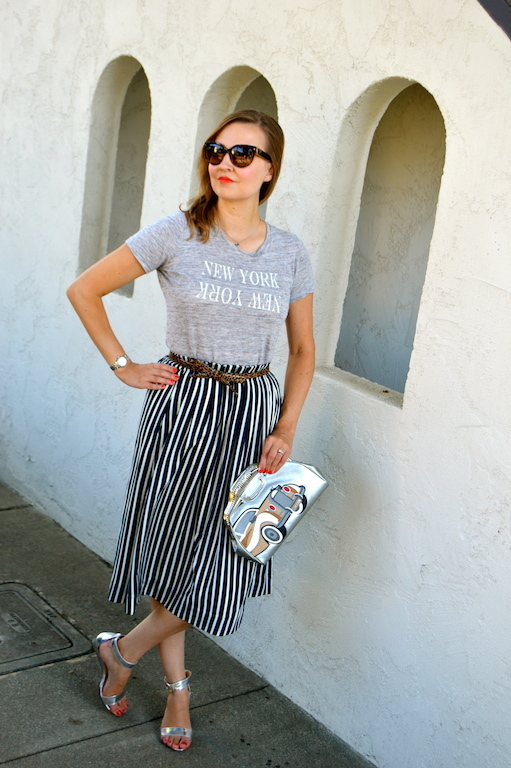 That skirt and tee go great together! omgosh I love this look! That clutch is amazing and was totally worth the purchase, again! Super cute clutch, love the outfit!! How adorable is that bag! I love your effortless, chic style here!